High above the Los Angeles skyline sits 71Above, the city’s "hottest" restaurant located within the US Bank Tower. Whether a native Angeleno or tourist with a palate for fine food, the restaurant with 360 degree views of the city, has become a place to see and be seen at. Measuring 950 feet above ground, 71Above is not for the faint of heart diners who have a fear of heights or fast moving elevators. One can’t help but feel a little mysterious when heading to dinner from having to check-in at ground level to taking not one but two elevators to reach the final destination. Stepping into the luxurious designed bar lounge area, the segmented pillars along the floor to ceiling walls, detail how far San Diego, New York, Atlanta, and other cities are from the city of angels. 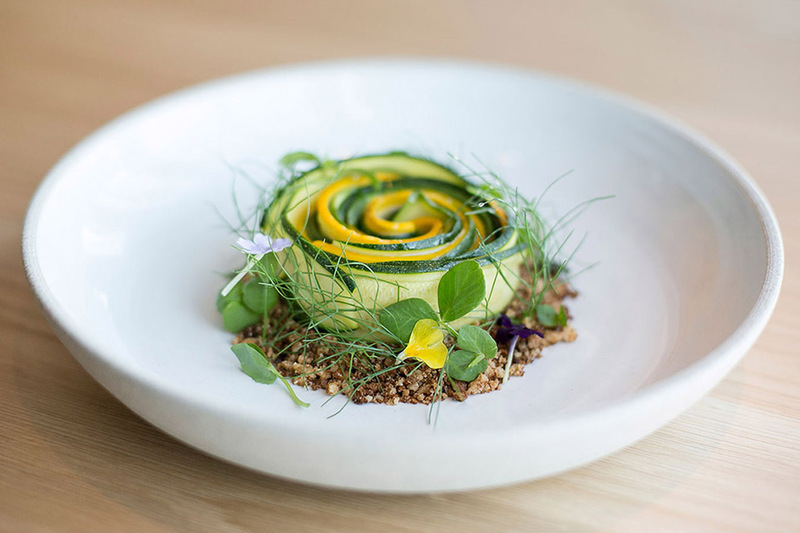 It’s pretty easy to see why 71Above has become one of the best restaurants with a view (courtesy of Eater LA). Looking out into the city reminds me how massive it is with freeways extending every which way, lights flashing from nearby buildings, and the non-stop infrastructures popping up all over the city. For those wanting to guarantee a table overlooking the city, the restaurant offers guests the opportunity to purchase their seats in advance which is literally the same as paying for your meal (dinner: $70 per person). I personally opted not to do so, and was pleased with my seating option. I will say this...next time, I might opt to purchase one of the Chef’s tables (seats four), to watch the kitchen staff prepare meals. Lead by executive chef, Vartan Abgaryan (Red Pearl), the modern American cuisine is robust in flavor, plays with vibrant colors, and takes taste buds on an exploration each course at a time. The three course meal is well priced at $70 per person, minus the additions of regular/non-alcohol beverages and desserts. Wondering if it's worth visiting for the view? I always say it’s what you make of it, but refrain from bringing a selfie stick. The upscale dress code does dictate the type of people who dine at 71Above, yet there are the occasional curious souls who must grab a shot of themselves gazing out into the city.